When does 21 equal 48? When you're in Kansas! 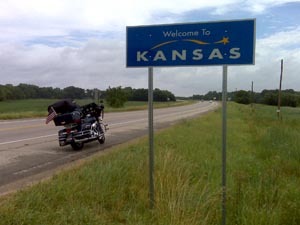 About noon today I crossed into Kansas, my 21st state on this trip. That marked the completion of the final major goal of this ride: to have ridden in all 48 lower states. After sitting nearly 2 hours in a gas station while a large thunder storm passed, I got back on the road and ran into rain just a couple miles out. It wasn't that heavy so I plugged my way through to the sunshine. The rolling hills of the Ozarks and eastern Oklahoma gave way to flat Kansas plains. Different but still beautiful. Off to Topeka tomorrow to visit my friend Jon Janes.